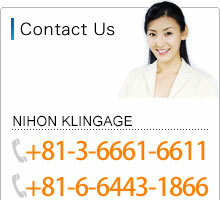 Since 1955, NIHON KLINGAGE has been making magnetic level gages in Japan and providing to the world. 1. Float chamber The chamber is made of non-magnetic material and is attached on vessel. A float is housed in the non-magnetic float chamber. The float will move up and down in the chamber as level rises or falls in the vessel on which it is attached. 2. Magnetic float Floats are individually designed and optimized for each application according to working condition. 3. External indicator The hermetically sealed indicator unit, which is mounted on the outside of the gage, contains a magnetic indicator that interlocks magnetically with the float inside the chamber. As the float moves up and down with the liquid level, the magnetic indicator element tracks the changes in level.